Seattle Parks and Recreation will gather community input about preferred programming and preliminary designs for a new environmental education center in the Washington Park Arboretum on Wednesday, Dec. 5. SPR project manager Susanne Rockwell said the park’s master plan originally proposed moving Arboretum Drive from the west side of the Graham Visitors Center to the east, abutting the Broadmoor golf course. 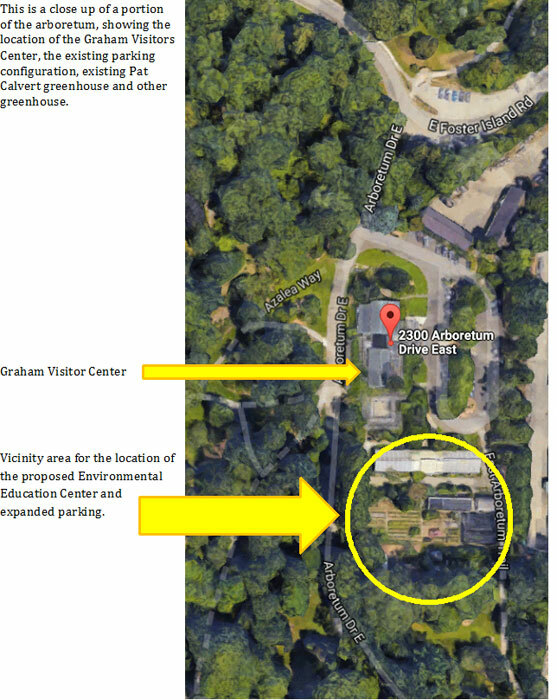 An environmental education center would have then been sited just west of the visitors center. The Master Plan Implementation Group decided not to go with that plan, Rockwell said, opting to take a cue from the renowned.Olmsted Brothers who designed the arboretum. There are three design concepts the community will be able to weigh in on during a pre-design meeting from 6:30-8 p.m. Wednesday, Dec. 5, at the visitors center, 2300 Arboretum Drive E.
The proposed site for the education center is south of the visitors center. About 10,000 square feet of space is what SPR anticipates for the education center. One of the preliminary designs proposes a two-floor concept, Rockwell said. The project is being accomplished using private donations and endowments through SPR’s partnership with the University of Washington Botanic Garden, which owns the plant collection within the arboretum, and the Arboretum Foundation. The two groups put in $200,000 for the pre-design study, and Mithun architecture firm was selected through a request for proposals to assist with this phase of the project. Rockwell said no taxpayer funding will be used for the project. SPR is also looking at expanding parking around the campus from 49 stalls to 98. Mithun, UW Botanic Gardens and Arboretum Foundation representatives will be at the December pre-design meeting to speak with attendees about the programming needs that would satisfy the master plan, Rockwell said, and also about options for the education center’s location: One option would be to move the maintenance barn, another would place it next to the visitors center, and the third option would place the facility slightly south of the Pat Calvert Greenhouse; the greenhouse is planned for relocation in each scenario. It is currently being used as an indoor classroom. “They’re not really getting into detail about the layout or all that,” Rockwell said about the goals for the Dec. 5 meeting. Once costs are known, a capital campaign to fund construction will start. The master plan calls for educating 20,000 students each year in non-academic classes. “I’m anticipating it will be a couple years out before they have all the funding in hand,” Rockwell said. SPR has no plans to impact UW’s plant collection. The environmental education center will have to meet LEED gold standards, but SPR is also aiming to qualify for the Living Building Challenge green-building certification program. Rockwell said the center’s environmental sustainability will be an educational opportunity in itself, and green stormwater infrastructure will also keep untreated runoff from entering Duck Bay like it does now. “This is really looking at what are the needs, how big does the building have to be to meet the needs of the education program, and then really know what the capital campaign should be,” Rockwell said of the upcoming meeting. While Mithun is preparing the pre-design study for the project, Rockwell said another request for proposal will be issued for a final design architect. The farther south the center is located from the visitors center, the more cost there will be for added utilities. “Right now, the utilities stop at the Graham Visitors Center, and there’s no fiber optic cable,” Rockwell said.